CCRH has released multiple publications. Here are the publications that have become available through RadarOpus. Currently 9 volumes are available, the tenth volume (Cynodon dactylon, ccrh8) will be released with RadarOpus 2.00 and automatically be added to the previous books for those who purchased the 10-volume package. Many plants synthesize substances that are useful in the maintenance of health in human beings. Over the time, the botanical studies carried out to know the in and out of these plants have seen a major evolution. The studies on physico-chemical, pharmacological and pharmacognostical properties of the plants have been carried out and many new methods have been designed to make the studies on plants more reliable and free of ambiguity. Various species of plants are largely used in Homoeopathy, in parts or as a whole. Unfortunately, our understanding of the plants and their homoeopathic use still remains limited, as opposed to the vast up-gradation that has been done in the plant literature. It is absolute necessary to update the present homoeopathic literature by incorporating the latest finding of these plants under Drug Standardisation, Drug Proving and Clinical Verification studies. Verification, by the Council's scientists. The results of the study, though reliable, await the confirmation of the experienced physicians, who are expected to use the medicine for the given indications and testify the same. Central Council for Research in Homoeopathy had undertaken the programme to clinically verify the symptomatic data of some Indian and rarely used medicines used in Homoeopathy. This includes the medicines which have had fragmentary provings and the medicines proved by the Council from time to time. In this volume, the clinically verified symptoms of 16 such medicines have been discussed in detail. 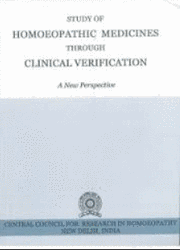 This publication aims at providing a different dimension of clinical verification to the study of Homoeopathic Materia Medica. Every symptom of each medicine is supported with definite data and based upon this, guiding features of the all medicines have been delineated. Each medicine in this book has been discussed with its scientific name, family, common name(s), and active principle(s) or alkaloid(s) according to the source of the medicine. This basic information is followed by the number of patients who were prescribed with the said medicine, along with all the potencies used. The basic information about the medicines is followed by a brief introduction and method of preparation. The Clinically verified symptoms are given in a tabular form with improvement status, followed by clinical symptoms. The guiding features of each drugs along with the modalities and causation indeed make it an interesting read. The Sphere of action of every medicine as observed during the study is mentioned separately which is followed by the Clinical conditions verified and these are listed in alphabetical order. The salient features of the medicines are mentioned under Discussion. Here, important features of some of the medicines having therapeutic value as given in important source books, are also included, which could not be verified due to paucity or non-availability of such symptoms in the patients who were enrolled in the study. This is followed by Comparison where few similar remedies are discussed. Under the section References, all the literatures which were referred to while prescribing the medicine during subsequent compilation, are listed as per the superscripted numbers.